← Community Managers. 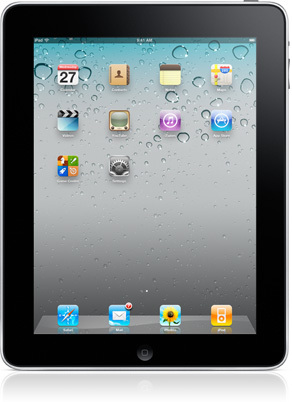 Why Do You Need Them? And What Do They Do? 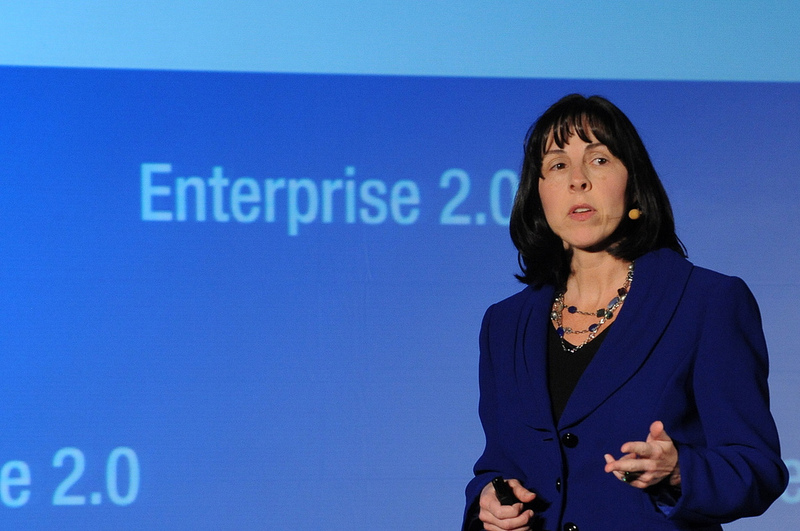 Last week, I announced The 2.0 Adoption Council’s Internal Evangelist of the Year for 2010 at the Enterprise 2.0 Conference in Santa Clara. Below is the text of the speech along with the award winner announcement. . . .
I’m here to announce this year’s Internal Evangelist of the Year Award. Before I do that, let me share a few words about The 2.0 Adoption Council. In the Summer of 2009 after the June Enterprise 2.0 Conference Susan Scrupski and a few conference attendees were reflecting over dinner conversation how very few practitioner cases studies there were at that conference. 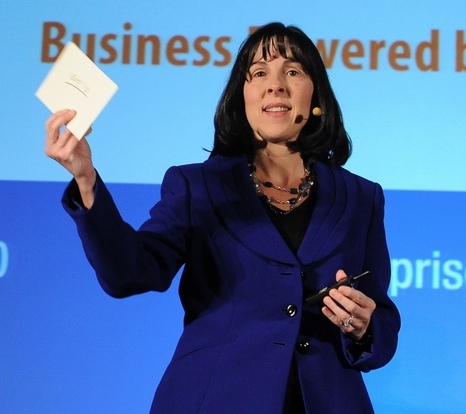 Hoping to change that, Susan formed the council to bring practitioners together to connect, share, network and advance the industry’s collective knowledge in this space around what it takes to build a business case, drive acceptance, drive adoption and drive a deployment program. Today there are around 100 active members, all leading enterprise 2.0 programs within their organizations. While we may all use different platforms and tools, we all share a common desire to transform the way in which our organizations work and the way in which our workers get work done. While I am further along in my own journey than perhaps new members might be, every day I still learn from a fantastic community of professionals, people who are leading very aggressive programs in their organizations. When I have questions, need to add new parts to our program, or figure out how to tackle an issue or benchmark best practices, I know I have ready access to a community of smart professionals to help guide me. I’ve also ensured to share my knowledge with other members as well. Bottom line, membership has been both job enriching and career enhancing. I’m here to give an award, right? So what is this award about? The nominees on the list this year received overwhelming endorsement from executives and colleagues within their companies as the candidates who represent all the qualities I described. As the winner of this inaugural award last year, I’m honored to pass the torch to a new IEoY this year. I know each and every nominee very well, and I’m glad I didn’t have to make the final decision. It would have been a tough choice. Every nominee has led impressive programs in their organizations. AND they have given back to the industry, sharing their knowledge, speaking at industry events or blogging their lessons learned. I’m thrilled to see these names on the list and I’m honored to call every one of these nominees my friend. So who are the nominees this year? 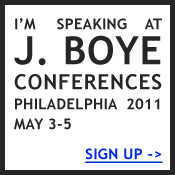 And now, it gives me great honor to announce the 2010 Internal Evangelist of the Year…may I have the envelope please. 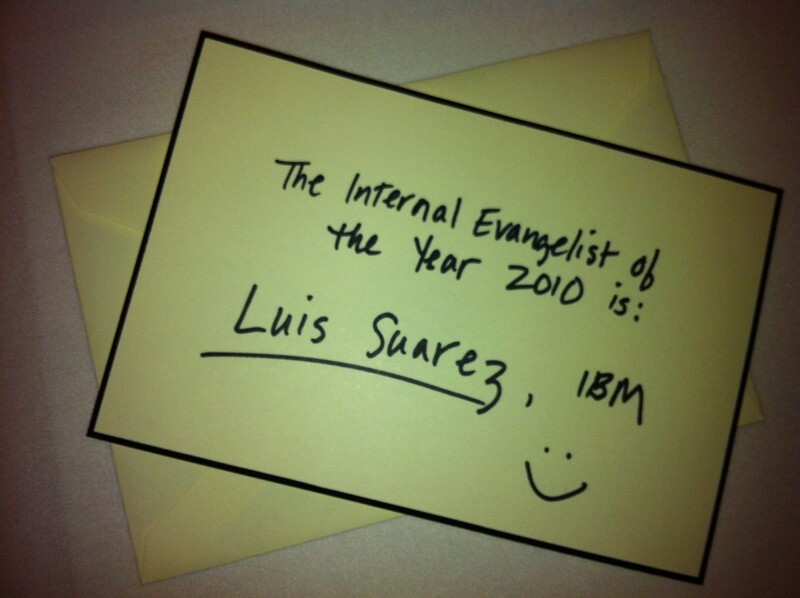 It’s with great pleasure that I announce Luis Suarez from IBM as this year’s IE0Y Award Winner. Congratulations to Luis! Well deserved! !